1. Weylyn’s story is told through the perspectives of the people he meets throughout his life. In your opinion, was this an effective way to tell Weylyn’s story? Did you feel like you got a chance to know him or did you wish you had more chapters from his point of view? 2. Weylyn’s powers allow him to affect parts of the natural world. If you could have a power that affects the natural world, what would it be and why? What possible repercussions could there be for using said power? 3. On page 163, Mary says “Without beauty, we’d be bored. Without science, we’d be dead.” Do you share her sentiment? How significant a role do you think beauty—or more specifically, the arts, literature, and the natural world—plays in our lives? 4. Many of the characters in Beasts are missing some form of human connection in their lives. Do you think this feeling is universal? Do people inherently need other people to be happy and fulfilled? 5. Weylyn spent much of his childhood with wolves, but in many ways, he defies the stereotype of the withdrawn “feral” child. Why do you think the author chose to write him this way? In what ways could his upbringing have contributed to his gregariousness? 6. On page 315, Weylyn writes, “My wolf brothers and sisters have a saying (or a howl) that goes, ‘Don’t leave anything you can’t come back to.’” Do you think it’s possible to pick up where you left off with a loved one after many years have passed? If you were in Lydia’s or Mary’s shoes, would you haven forgiven Weylyn for disappearing? 7. What does the title, Beasts of Extraordinary Circumstance, mean to you? 8. Many of the narrators in the book don’t fit in socially with their peers. Even Weylyn, to an extent, wants to find a place where he can belong. To what degree, if any, should we change ourselves to fit in? 9. In chapter 61, Mary notices a far-off look in Weylyn’s eyes. They are torn between the home they’ve created for themselves and the need for adventure. Which would you choose? Cozying up at home or exploring a new place? 10. The characters in Beasts are witness to incredible natural events. Have you ever had any amazing or strange experiences in nature yourself? If so, how did you react? It was the morning of my eleventh birthday, and as usual, my dad had failed to notice. It wasn’t that he didn’t care; he had just never been one for party planning or affection in general. That had been my mom’s job. Still, a card would have been nice. Instead, he gave me my order for the day. It was 5:00 A.M., and he handed me a postcard. “It’s all one order. The directions are kind of confusing, but I’m sure you’ll figure it out.” Without another word, he walked back into the freezer and shut the door behind him. Enter from the southwest corner of the forest. Follow the path for a half a mile, then follow your nose. I hitched my icebox trailer to my bike and set out just as the sun began to outline the jagged tree line. Five minutes deep into the forest, all I could smell were pine needles and the first of the season’s bee balm. I love the smell of bee balm. My mother used to tie a bundle to the clothesline upwind of the laundry as it dried, so my sheets would come out smelling like fresh air and mint. She had an elevated sense of smell like a bloodhound, so half her day was spent sniffing out odors and concocting perfumes from things she found in the woods behind our house: pine and juniper for bathroom odors; lemon and sage for smelly drains; a cocktail of water, dandelion, and crushed peach pits worked great on upholstery; and a towel tumble-dried with cinnamon sticks was a surefire cure for a wet dog. Breakfast was her favorite time of day. Every morning, I would find her in the kitchen in a state of euphoria as her nostrils gulped the scents of bacon, eggs, and syrup. I even caught her drooling on her apron a few times. Watching her eat was even more fun. Every bite she took was followed by a series of mmmms and I’ve outdone myselfs, even when all she had made was buttered toast. Her food was usually underseasoned for my tongue, so I’d sneak a dash of salt when she closed her eyes, something she did when she swallowed so she could concentrate on the blooming of every taste bud. I once joked she should wear earplugs, too, and was then asked if I could pick some up for her next time I was at the store. Her condition wasn’t all syrup, bacon, and eggs, however. I once forgot to take the trash out, and one whiff of it caused my mother to pass out on the kitchen floor. I quickly got rid of it and revived her with an orange peel. When she had her stroke last year, I tried basil, lavender, ginger, garlic, anything I could find until the doctor told me to stop. For her funeral, her friends brought bouquets of not only flowers but also dried herbs, soaps, fruits, sandalwood, and other sweet-smelling things. When I looked at her in her casket, I pretended she had just closed her eyes for a moment so she could take them all in at once. I hid a piece of orange peel behind her right ear. I stopped my bike and smelled the air. It would have helped if I knew what I was supposed to smell or whom I was meeting or what. Then it hit me like the punch line of a bad joke, every foul-smelling particle of it. I opened my mouth to cough, and my tongue absorbed it like a sponge. I stuffed my mouth with mints fluffy with pocket lint and looked for the source of the smell. It didn’t take long to find the carcass of a dead raccoon half-hidden in the bushes beside my feet. Is this some kind of prank? I thought. Had I been dragged out into the woods at 5:00 A.M. just to smell a dead raccoon and go home? If I had, that would have been the time for the comedian to jump out from behind a bush and shout, “Gotcha!” so I could run him over with my bike. “This is dumb,” I muttered to no one and steered my bike back the way I came. My pedals had only completed one full rotation before I stopped again. Another smell overtook me: smoke. Someone somewhere had a campfire going. It was the only thing I had to go on, so I left my bike on the path, unhitched the trailer, and followed my nose through the brush. I was surprised when I found the campsite. Not that I thought it didn’t exist but that my sense of smell led me right to it. My mother would be proud. At the mouth of a narrow cave, there was a clearing. In the center of the clearing was a crackling fire, but—as far as I could tell—no one to tend to it. In fact, there was very little that suggested anyone had ever been there, aside from a cast-iron pan and a single sock half-buried in the dirt. “Hello? Is anyone there?” No response. Whoever it was, was probably gathering more firewood or relieving himself behind a tree, something totally ordinary, not the things my brain was telling me he was doing, like putting the finishing touches on his booby trap. Then I heard something my brain had not prepared me for: a low growl. I turned slowly toward the sound and met the eyes of a terrifyingly beautiful gray wolf. Her ears were back, and her fur formed a serrated crest along her spine. Her fangs were long, and her claws were sharp. I’m sure she had many other worthy qualities, but the dangerous ones were all I could concentrate on at that moment. I closed my eyes and pictured my mother making bacon for me in her new kitchen. I snapped out of my daydream to find a boy, a human boy about my age, jumping between the wolf and me. “It’s okay, Ma. I invited her here. She’s brought us breakfast.” He gestured toward the icebox. The wolf snorted and shot me a warning glance before lazily collapsing next to the fire. He was filthy from head to toe with a wild crop of brown hair and silvery-gray eyes. His clothes were damp and smelled like wet dog. I desperately wanted to throw them in the dryer with a cinnamon stick or three. “Comin’, Ma!” The boy grabbed a raw steak and tossed it to her. She gobbled it up in a matter of seconds and flopped back on the ground, pleased. “I guess.” If it hadn’t been my mother’s name, I wouldn’t have thought so. Most people think she named me after her, but I was actually named after Mary Tyler Moore, her favorite actress. “Yeah.” I didn’t mean to say it, but maybe I was just tired of pretending it wasn’t true. I pretended to think about it and said my other plans could wait. Most girls celebrate their eleventh birthdays with a few of their friends from school. They eat cake and ice cream off paper plates and sit and gossip about the girls who couldn’t make it. They talk about articles they read in magazines stolen from their older sisters, using phrases like second base and frenching without actually understanding their meaning. I spent my birthday with a pack of wolves. They were very welcoming, allowing me the best spot next to the fire and licking my face clean after I had eaten. Even Weylyn’s mother warmed up to me after a while, inviting me to scratch her belly and ears. Weylyn also proved to be better company than I had had in a long time. He told stories about life in the pack: stories about friendship, long winters, the hunt, and being hunted. He even told me about his parents (the human ones). “Our house backed up onto the woods,” he said, gazing over my shoulder as if the house were right behind me. I nearly turned to look, but stopped myself. “It had a fire pit where me and my parents would roast hot dogs and marshmallows and stuff. One night, this wolf came sniffing around,” he said, nodding at Ma, who was curled up by his feet. “I was scared at first, but my mom told me it was okay. She said the wolf was just hungry and threw her a hot dog. After that, Ma would show up every time we lit a fire. At first, it was just ’cause she wanted hot dogs, but then I think she liked being around us.” Weylyn ran his fingers through the scruff of Ma’s neck. The wolf sighed contentedly. I wasn’t used to talking about death. My dad and I avoided the topic as much as humanly possible. During my mom’s funeral, he mostly just sat in the corner of the room, humming to himself. When people offered their condolences, he asked them why, as if he hadn’t yet heard the news. It made some of the mourners second-guess whether they were attending the right funeral. “Do you ever miss them? Your parents?” I asked. “Yeah. I do,” he said, his bottom lip quivering slightly. Weylyn’s expression shifted gears. I could tell, even before he spoke, that he had drained his mind of his own sadness and replaced it with empathy for mine. “I’m really sorry,” he said, and meant it. It was almost noon. The fire was dying, and the wolves were all napping in the sun. Weylyn and I licked the last of our meal off our fingers and were ready for a nap ourselves. “This is the best birthday I’ve ever had,” I said with a full belly and a full heart. “It’s not over yet. You can’t have a birthday without a gift.” Weylyn jumped up and ran into the cave. I heard him rummaging around; then he came back out with both of his hands behind his back. “Close your eyes,” he said, giddy. I closed them, and he placed something in my hands. It was a postcard. On it was a picture of the ocean during sunset, fiery orange and pink with text over it that read: WISH YOU WERE HERE. I did. When I got home, I placed it on my nightstand. It was the first thing I saw when I woke the next morning. 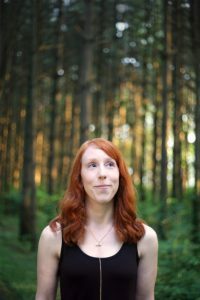 A Conversation with Ruth Emmie Lang — Plus Recommended Reading! The idea for Beasts started with an image I had in my head of a beekeeper leaning over a glowing beehive. At first, I thought it would make a cool illustration, so I attempted to draw it. After realizing that my artistic skills weren’t quite up to par, I decided to write a short story instead. That one story became a series of tall tale–style stories, and at some point, I realized they could all be part of a larger narrative. I guess you could say I wrote a book by accident! While writing, I drew a lot of inspiration from the great outdoors. I have a deep personal appreciation for all things wild and would happily spend all day outside if I could (although, I’m a redhead, so that’s probably not the best idea). I think magic and nature complement each other because so much of the natural world is yet to be explained, and magic, by definition, is unexplainable. Have you ever met a wolf in real life and what was it like? I did! It was one of the coolest experiences of my life. She was a gorgeous gray wolf from a sanctuary in Ohio. When we were introduced, the first thing she did was rub up against my leg and kiss me. I grew up with a dog, so I was surprised by the similarity in their mannerisms. She even liked getting her belly pet! This was months after Beasts had already been released, so I was relieved to know that my descriptions, while a little on the fantastic side, were not that different from the real thing. What made you decide to tell Weylyn’s story through different points of view? I chose to tell Beasts from multiple perspectives for several reasons. First, I liked the idea of Weylyn as a mythical figure who leaves stories behind wherever he goes. Someone living in Oklahoma and someone else living in Oregon could each hear an urban legend about Weylyn and never know it was about the same person. Second, I consider Beasts not only to be a story about Weylyn, but also a story of how he affects the lives of the people he meets. In that way, each character becomes a part of Weylyn’s mythology. Third, I think telling the story through other people’s eyes makes the fantastical elements more believable. No narrator is 100 percent reliable. They all have their own beliefs and biases, which undoubtedly influence their interpretation of the events that take place. How do you push through writer’s block? I am no stranger to writer’s block. I’ve found that if I wait until I feel inspired to write, I never get anything done. What works best for me is to have a set writing schedule. I force myself to write anything—even if it’s terrible—for at least one to two hours most days. I find that if I stick to a schedule, eventually I’ll get into a rhythm and the ideas will flow more naturally. I have many drafts of stories that live on my hard drive and will never see the light of day, but I don’t regret having written any of them. Like panning for gold, you have to sift through a bunch of bad ideas before you get to the good ones! What research did you to do write this book? I am not a zoologist, or a logger, or a beekeeper, so I can’t speak to any of those topics with any authority. I did, however, do research in order to make those chapters of the book read in a believable way while still leaving room for fantastic embellishment. For the logging chapters, I researched the key vocabulary and watched hours of documentary footage about the logging process. Obviously, a forest growing overnight is far from realistic, but I tried to ground the logging crew in reality, so the reader wouldn’t have to work as hard to suspend their disbelief. As far as the wolf chapters go, I definitely took some artistic license, but only after watching various documentaries about wolf behavior. Mary’s glassworm research in the beginning of book 3 was based on research my sister was doing at the time while completing her master’s degree, so she was a great resource. Again, I tried to strike a balance between telling a good story and including enough relevant scientific detail that Mary felt convincing as a zoologist. Do you have a favorite scene from Beasts—why that scene? My favorite scene in Beasts is when Weylyn leaves Mary to go back to live with the wolves. It was a hard scene to write, because I hated pulling them apart, but it felt right. Weylyn was torn between two identities: that of a wolf and that of a man. He never felt quite at home in society, despite his best efforts to belong, and when his powers put Mary’s life as risk, he decides that the human world is maybe better off without him. I knew that ultimately I would bring them back together, but I didn’t yet know how, so it was a sad scene for me to write—I may have even teared up a little. As a writer, I get really attached to my characters, which is probably the reason I like to give as many of them happy endings as possible! This collection of short stories is what made me fall in love with magical realism. Each story is beautiful in its strangeness, exploring some of the weirdest and wildest corners of Florida. If you like the story “Ava Wrestles the Alligator” and want to read more, Russell penned a novel with the same setting, Swamplandia! Odds are, if you haven’t read this one, you have at least heard about it. It is an incredibly popular book and for good reason. I listened to it on audio during my daily commute, and there were times when I would arrive home only to sit in my car for fifteen minutes until the chapter I was listening to had finished. I love hiking, so listening to Cheryl’s journey made me feel like I was out there with her, blisters and all. The Name of the Wind is, in some ways, a traditional high fantasy story—boy who realizes he has a special power and enrolls in a magical school to master said power—but its execution is by no means typical. Kvothe, the hero, is one of the best written characters I’ve read in years. He’s charismatic, witty, bold, and plays a mean lute! This romping YA is part high-stakes adventure, part coming-of-age, and part love story. Similar to the The Name of the Wind, The Gentlemen’s Guide to Vice and Virtue stars a mischievous protagonist whose hubris is both his tragic flaw and part of his charm—think: a young Hugh Grant. Despite his rakish reputation, Monty has a heart of gold that makes it easy to forgive his transgressions. Have you ever eaten a sad piece of cake? Rose Edelstein has. She can taste emotions in all kinds of foods, an ability that is occasionally thrilling, but more often, burdensome. I listened to this book on audio during a road trip to Virginia, and by the time I got to my hotel, I really wanted lemon cake. Although I recommend this book, I wouldn’t suggest reading it on an empty stomach. Atlas Obscura is proof that the truth is sometimes stranger than fiction. This book is basically a catalogue of every strange and obscure roadside attraction on the planet, ranging from crystalized skeletons to hair museums to gardens made entirely of poisonous plants. In their first-ever print book, they highlight the best oddities their website (and the world) has to offer. This melancholy book about a couple living in the snowy Alaska wilderness is part fairy tale, part family drama. Jack and Mabel always wanted a child, and finally get one when the little girl they build out of snow comes to life. It’s a heartbreaking book, but the language is lovely, and the setting will make you want to cozy up by the fire. I’m recommending these classic books not because I think you haven’t heard of them, but because I would be remiss if I didn’t mention the story that made me want to become a writer. I don’t read much high fantasy, but to me, The Lord of the Rings is the perfect embodiment of the genre (and storytelling in general). If you don’t want to commit to reading the whole series start to finish, the movies are wonderful, too. 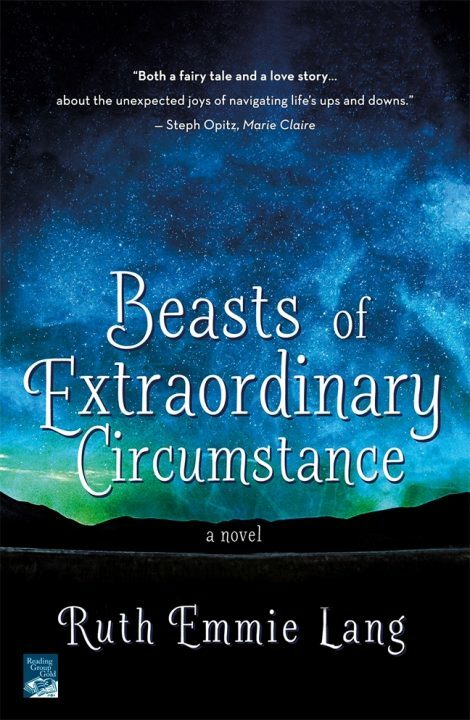 When I started writing Beasts of Extraordinary Circumstance, I didn’t know it was a book yet. It was a short story, or maybe a collection of short stories, or a series of illustrations that I didn’t have the adequate artistic talent to execute. So, if you had told me when I was sitting around in my pajamas drawing amateur wolf doodles that I would have a publishing deal in three years, I wouldn’t have believed you. I also wouldn’t have believed you if you had told me that the day my editor made the offer, I would be in too much pain to walk. I used to be pretty good at walking. In fact, I could walk so fast that I called it running, and I’d run for an hour, sometimes two. For twenty-eight years, I was lucky enough to be able to take my feet and my body for granted. Then in the fall of 2014, my luck ran out. “What is it that’s wrong with you again?” I got this question a lot from well-meaning friends who, understandably, were confused by my situation. “I don’t know,” I felt like saying, because, for a long time, I had no idea what was happening to me and neither did many of my doctors. My medical history was one huge, terrifying Rube Goldberg machine, each ailment comically stumbling into the next while I sat by with my feet propped up on a pillow, helplessly watching it happen. For over a year, because of what seemed to be circulatory problems in my hands and feet, it was too painful for me to walk, go out in the sun, or even tie my shoes. Several months and one postponed wedding later, my pain had escalated to the point where I barely slept, and when I did, I’d wake up every hour or two. One night, I dreamed that a cat was biting and clawing at my feet, then I woke to the kind of tremendous pain that such an attack would illicit, only there was no cat, only my own body clawing at me from the inside. The next morning, Max, my fiancé, made me chocolate- chip pancakes with raspberry syrup, and when I was finished eating, I broke down in tears. Not because the pancakes were bad (they were delicious), but because they were the only thing I was looking forward to that day or the next or the next, and now they were gone. One trip to the emergency room and many doctor’s visits later, the mystery of what was causing my pain was mostly explained. Due to an extended period of immobility, the veins in my legs weren’t working efficiently as they should, and my poor shoulder posture was causing my muscles to compress my nerves and possibly the vasculature of my upper extremities. In the fall of 2015, I began down the long, frustrating road to recovery—literally. I ditched my crutches and hobbled in small circles around my apartment, trying to flex the stiff muscles of my puffy, red Muppet feet. I swallowed my screams, gritted my teeth, and listened to a lot of This American Life. I imagined Ira Glass narrating my story someday, his matter-of-factness a soothing balm on my emotional burns. I hoped for a day when I could tell my own story with the dispassion that comes with time and distance. I also hoped that I wouldn’t blow what could be the biggest opportunity of my life. Writing is hard on a good day. You can sleep in, eat a balanced breakfast, take a long, hot shower, then open your laptop and not write a single word. Now imagine trying to write on a computer whose keys feel like they are made of overturned thumbtacks. I’ve never walked on hot coals, but the goal was essentially the same: do it as fast as possible. This was how my hands felt during the first set of revisions for my editor. Max kindly offered that he type while I dictate, like I were an aging novelist hermit and he, my eager apprentice, but I said “no.” I needed to see my words on the page to know if they were the right ones, so I took a deep breath and danced my fingers across the coals. Courage is defined not as the absence of fear, but the willingness to do take action despite being afraid. By that definition, I guess I must have been brave, because I was terrified 90 percent of the time. My worst fear—that my illness had rendered me incapable of writing about anything other than my own sadness and boredom—thankfully did not come true. In fact, what happened was exactly the opposite. Once I started putting words on the page, words I was happy with, I could feel myself relax. It was the perfect escape. For a few hours a day, I got to pretend to be someone else, someone who could do all the things I couldn’t. I hiked through forests, swam in the ocean, and ran with a wolf pack before collapsing in front of a warm campfire to rest my feet, which were sore from the day’s adventures, not illness. Some of my favorite chapters were written during these months of pretending, and also, some of the saddest. The protagonist of Beasts of Extraordinary Circumstance, Weylyn Grey, has strange abilities that he struggles to control. On good days, his gift is a magical oddity, but on bad days, it’s dangerous and debilitating to himself and the people he loves. I know how he feels—well, not the magic part, but the being-out-of-control-of-your-own-body part. We had something in common, Weylyn and I: a fear of ourselves. Both of our bodies had betrayed us and we struggled to be able to trust them again. We isolated ourselves. We waited for our luck to change. Sometimes, we waited too long. I’d been hurt and so had he, and so we suffered together in the way only a writer and her hero can. And then, we said good-bye. Every time I finished a round of revisions, I’d slip into what I’ll refer to as my “Airbnb funk.” If you don’t know what that is, it’s when you’re so restless that you spend hours on Airbnb and plan vacations you can’t go on. After my first round of revisions, I planned a trip to the Pacific Northwest. After the second, I planned a trip to the American Southwest. By the third round, I decided enough was enough, and I rented an actual cabin in the actual woods for a night. It wasn’t a vacation per se, but it was the first time in two years that I’d spent the night anywhere other than my own bed. By that point, I was walking again—albeit slowly—and was able to hike the rough three-mile trail through the park’s caverns. After our hike, Max and I retired to our log cabin, ate dinner, and huddled under the same blanket as we roasted marshmallows. As I listened to the crackle of the dying fire, I pulled out my last set of revisions for Beasts, and wrote the final sentence. I wish I could say this essay is my Ira Glass moment. The moment when I tell you that what happened to me is all in the past and I’ve moved on with my life, and for the most part, that would be true. I’ve started running again, and although I still get nerve pain in my hands, with physical therapy, I should make a full recovery. I’m no longer forced to cancel plans because I misplaced my only pair of comfortable pants, and I (almost) never cry while eating pancakes anymore. I still haven’t had a wedding yet, but thanks to the good people at the Franklin County Courthouse, I have a husband, and that’s the important part, anyway. And I have a book, one that by some miracle, I was able to finish despite my circumstances. I’m not Weylyn, but telling his story helped get me through the worst part of mine, and for that, I am forever in his debt.